Once made up in water how long does it stay active? Each tablet liberates 1000 parts per million available chlorine per 1 litre of water, even after 5 years of storage. A non-exhaustive method of cleaning and disinfecting many different items, our Gompels Chlorine Tablets are intended to offer exceptional value. This large pack of 200 sanitiser tablets can be diluted and dissolved in either warm or cold water and used to sanitise a wide range of surfaces, equipment and utensils. Each tablet liberates 1000 parts water per million available chlorine pet 1 litre of water, even after to 5 years of storage making them a long lasting and economic choice. 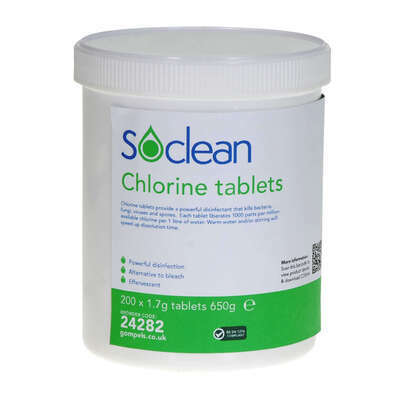 Compatible with neutral detergents, these chlorine tablets effective disinfect your work environments to kill bacteria, fungi, viruses and spores. Dish cloths, mops etc 60ppm: Dissolve 1 tablet in 16 litres of water, soak to bleach clean and deodorise. Do not soak overnight. Here at Gompels, we have a wide range of alternative items to our chlorine tablets such as our Gompels Foaming Antibacterial Cleansing Spray which kills 99.999% of bacteria.